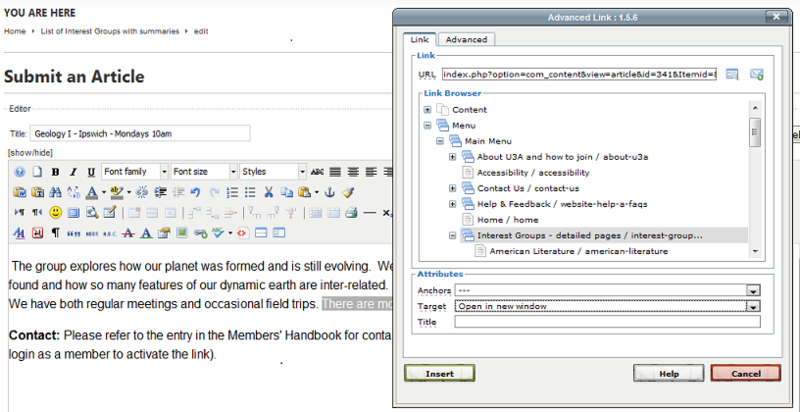 The aim of this document is to show how links can be added to Articles. 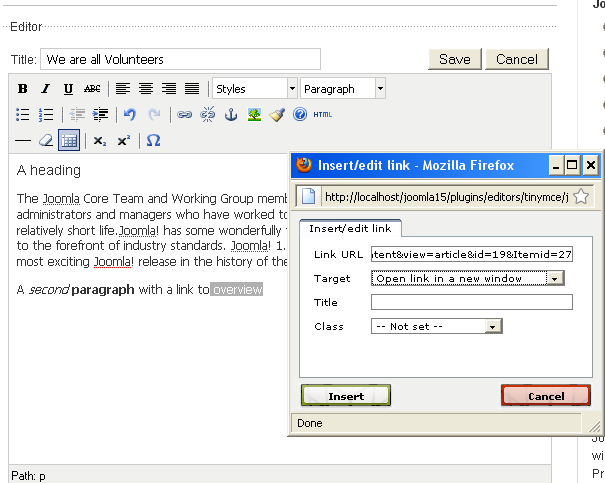 It is one of four documents with hands-on instructions about editing Articles in a series introducing Joomla! version 1.5. One of the key features of documents on the web that they can have links to other web sites, making any one web page part of a large network which extends beyond the text on the screen - thus the term hypertext. Links are also used to navigate within a Web site and even within the same page. The menu and article details will vary from site to site and the detail depends on the editor used. Open the menu/artilce you want to link to. Copy (Ctrl-c does this) the address in full from the top of the browser screen. If you have sample data on a localhost web site, link something to the Menu 'More about Joomla! Link URL:Paste the URL of the part of the website you want to link. When the article is saved - check that the link works. Another editor Some editors allow for choosing menus and articles within the current web site, as the illustration shows. Find the menu that you want to link. This shows all the options below that menu item. Click Target - there is a list of choices.